NEED A GOOD LAUGH FOR THE HOLIDAYS? "A DREADED XMAS - more xmas negatives", is a group of songs, many of which are destined to become classics. Take the humerous approach of Weird Al Yankovic and add carfully crafted original songs. Then add musical styles akin to the Beatles, Ramones, Tom Waits, to name a few. Put them all together, and you've got the makings of musical holiday delight. You don't need to be in the Christmas spirit to get into this album. You just need a sense of humor! 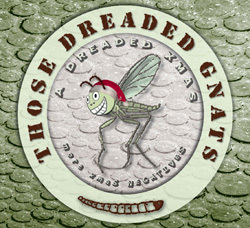 With the exception of their reggae version of Grandma Got Run Over By A Reindeer, all of their vocal tracks are THOSE DREADED GNATS original compositions. Each in their own genre. All with a life of their own. Feel free to go our listening station to hear samples of each song.